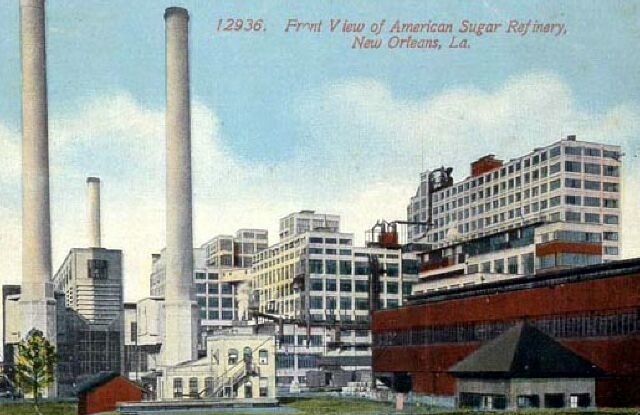 The Domino Sugar Refinery is located at the Mississippi River in the town of Arabi in St. Bernard Parish. It was opened in 1909 by the American Sugar Refining Company (ASR), which then owned the brand, Domino. The facility opened after a multi-year construction period. ASR was a New Jersey company that expanded into the New Orleans area. The Domino Sugar refinery is the largest sugar refinery in North America and produces two billion pounds of sugar every year and employs about 400 people. It has been making sugar and employing people in St. Bernard Parish since it opened. The refinery primarily processes sugar from Louisiana, Florida and Texas. Its sugar is made for consumer use, commercial use in candy, and for other commercial food purposes. Although it is a modern facility today with robots and other high tech equipment, the process of refining sugar remains basically the same as it did when the plant was built. The refinery utilizes its location on the Mississippi River, the nearby railroad, and trucks for the intermodal transportation of raw and refined products.